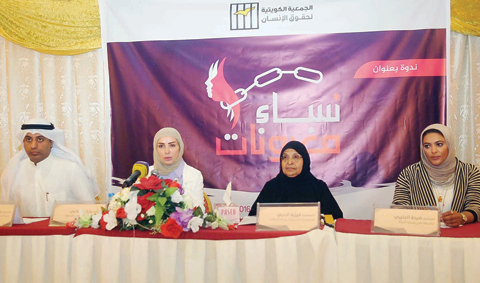 KUWAIT: The Kuwait Human Rights Society organized a seminar titled ‘Oppressed Women,’ moderated by attorney Athraa Al-Rifaie, the head of the complaints committee at the society. Three speakers spoke about the meaning of oppression, providing shelter for those who face social cruelty, and legal and human aspects of oppression. Fouzia Al-Hajji, the adviser of the undersecretary of the Ministry of Awqaf, spoke about her journey of creating a ‘Markaz Al-Ta’ebat,’ which means repentant center, that hosts former drug addicts with and without their children. “The ministry provides educational and psychological rehabilitation programs for them and their children in order to educate them to become effective members of the society and helping them to achieve financial independence,” she added. The center, however, has kept a low profile for over 10 years because it does not want to risk the lives of the residents. Mohammad Al-Humaidi, head of the Kuwait Human Rights Society, talked about legal complexities and threats that confront women in Kuwait, including domestic violence, sexual and verbal abuse, paternity proof by DNA tests and rights of children from non-nationals. He also addressed cases of women admitted to the psychiatric hospital to usurp their money and those who have been fraudulently sent to jail. At the end of the seminar, attorney Shaikha Al-Julaibi presented a case of a woman who has been suffering from domestic violence and has nowhere to go, and how her life has turned to hell because she’s not allowed to rent a place and live independently in Kuwait. “She can’t even stay in a hotel if she does not have a marriage contract with her. Some women in Kuwait commit a crime sometimes just to live in prison, because they have no place to go!” she said. Julaibi mentioned that there are shelters for vulnerable women in all GCC countries except Kuwait. All the speakers agreed that laws and regulations have to change to achieve justice and ensure security and social stability for women in Kuwait. The Kuwait Human Rights Society was established in 1988.